A friend of mine, Mrs Mary Chapman, once described Stuart News reporter, Ed Killer, as “the only reporter in America who got her to read the sports page.” I feel the same way. Ed Killer’s past Sunday article entitled: “Bearing Down for the Bear Hunt,” was quite the read, and I have been thinking about it the past few days. Bears….to think that they used to live right here in along the waters of the St Lucie River and Indian River Lagoon, and now there are none. Today I thought I’d share a photo I have shared before, but it is certainly worth dusting off and bringing out of the archives again. “At one time, Florida black bears existed in fairly large numbers along the ocean coast between Jupiter and Fort Pierce, living in and among the mangroves and feeding on palmetto fruits and turtle eggs buried in the beach sand. However, as more people began settling the area, bears became unwelcome guests, and many were hunted and killed by early pioneers. By the 1920s and early ’30s there were still a few wild black bears in the area. They found a tasty delight in honey and bee larvae from the numerous beehives in operation on Hutchinson Island at that time. 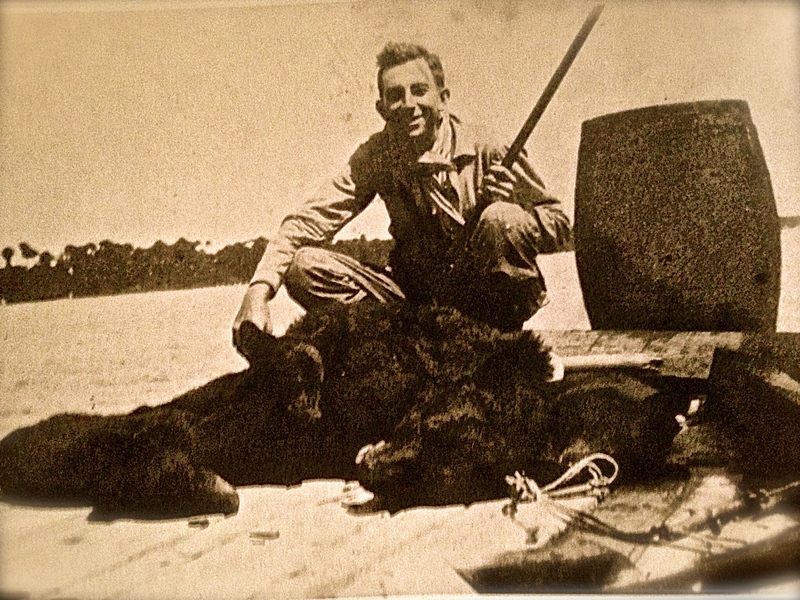 Jensen resident William Pitchford felt the only solution was to hunt down the bear that had been raiding his bee hives during the summer of 1931. Pitchford first thought to capture the bear using a steel trap he set out over several nights near the hives. The bear, however, was too smart to fall for that trap, avoiding it each night and still getting into the honey, destroying several hives. Also, I must state that the structure of the agency is confusing like everything else in government. There is “US Fish and Wildlife,” a federal agency, and then there is FWC, or the Florida Wildlife Commission, a state agency. One will also hear this same agency referred to as Florida Fish and Wildlife Conservation Commission. Why I am not sure. 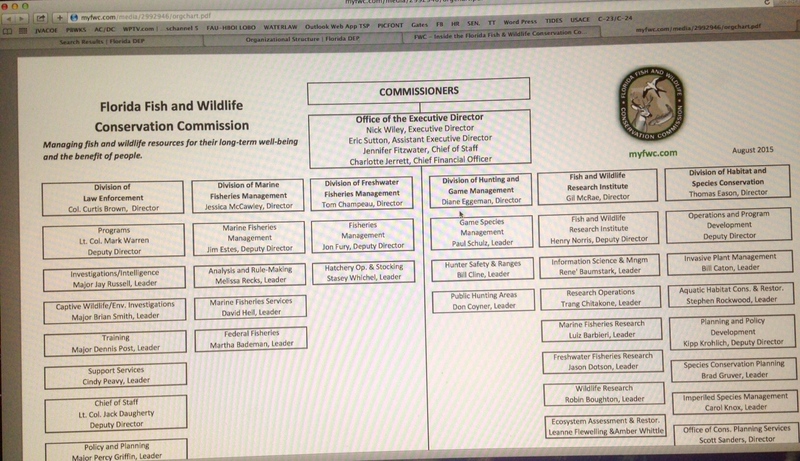 So Florida Wildlife Commission (FWC) and Florida Fish and Wildlife Conservation Commission (FFWCC) are the same thing. If anyone knows more about this please let me know…. “The FWC was established with a headquarter in Tallahassee, the state capital on July 1, 1999 after an amendment to the Florida Constitution approved in 1998. 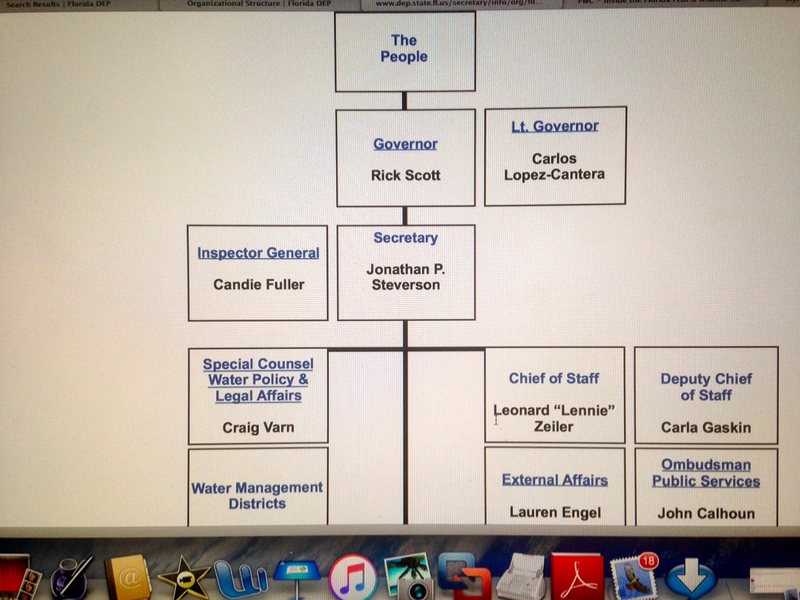 The FWC resulted from a merger between the former offices of the Marine Fisheries Commission, Division of Marine Resources and Division of Law Enforcement of the Florida Department of Environmental Protection (DEP}, and all of the employees and Commissioners of the former Game and Fresh Water Fish Commission. 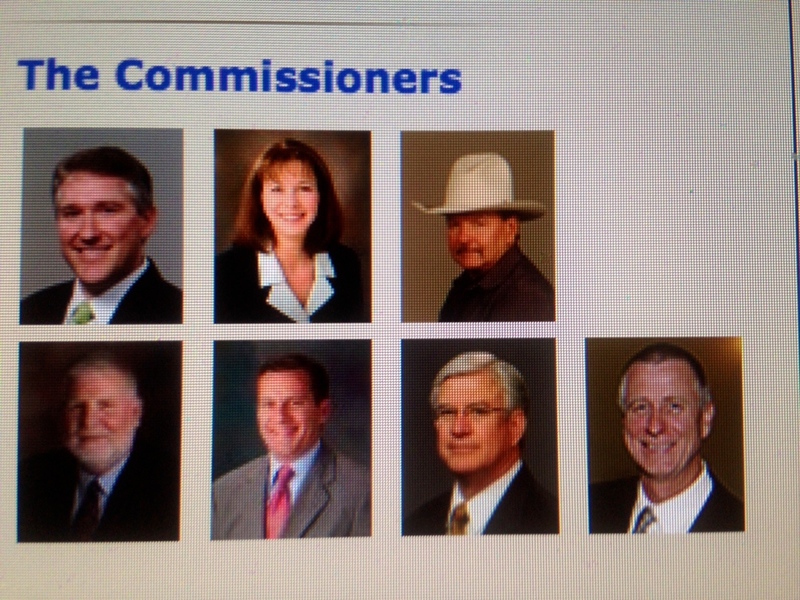 Looking at the structure one can see that the commissioners are at the top of FWC chart and the “people” are over the governor for DEP chart…. If the bears had a seat at the table, I wonder where they would be? 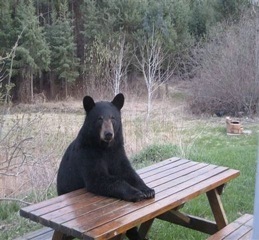 Black bear sitting at a picnic table, a popular image on Facebook, 2014. When I was a kid, I had a favorite stuffed animal; he was orange bear with blue eyes and his name was “Beary Bear.” I carried him around until his eyes fell off and my mother sewed new ones back on. Over the years, all of his fur came off so he was bald. There wasn’t a whole lot “to do” growing up in Stuart in the 1960s and 70s so a kid had to rely on the freedom of empty lots, friends, and his or her imagination to have any fun. Before dinner, I used to climb to the top of a giant cedar tree in our back yard and look at the ocean and Indian River Lagoon from our house in St Lucie Estates, in Stuart. 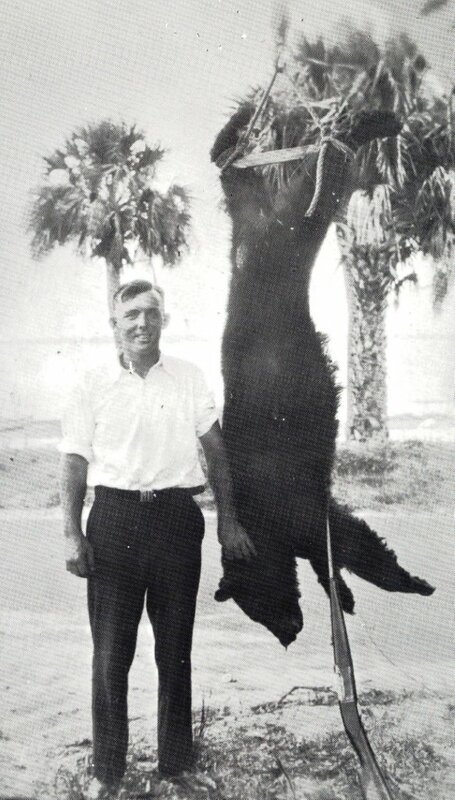 I carried Beary Bear up about forty feet with me and we talked about the black bears out there on Hutchinson Island and how there were just a few secret ones left, a few Mr Walters and the other pioneers couldn’t catch, and didn’t kill. That was fantasy. Isn’t it amazing to think of where we really live? A land where not too long ago a panther may have swum across the St Lucie Sound; or a black bear happily frolicked along the Indian River Lagoon? Where fish were so plentiful they kept you awake at night. What I don’t understand is why we “wiped them out.” I guess times were harder then and the mentality was 100% “man over nature” but it’s fun to imagine what it would be like if we hadn’t killed them all, or somehow, we brought them back. Well, Beary Bear is long gone, and the bean farms have been replaced with million dollar homes and unimaginative condominiums. But I still have my imagination and somewhere out there, there’s a bear; I’m sure of it.